I was reading CNN.com earlier today, catching up on the latest entertainment news (ok, it was people.com) when I came across an article about Uggie, the canine star of the Golden Globe winning film "The Artist". Apparently Uggie stole the show from George Clooney during Sunday's awards ceremony, giving Clooney a run for his money when it comes to making the fans gush. Now, you all know I love a good metaphor....well, here comes another. 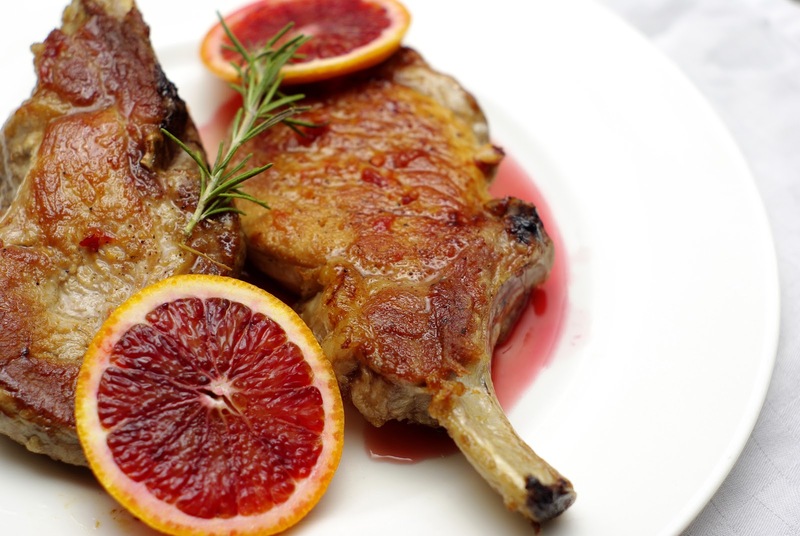 In this recipe, the role of Clooney is played by the pork chop. Normally, the drool-worthy star of any dish, here it takes a supporting role to an unexpected star: the delectably sweet, sour, and slightly spicy blood orange glaze. This glaze is simple to make, provided you can get a hold of blood oranges, which happen to be available in abundance right now at our local grocery store. 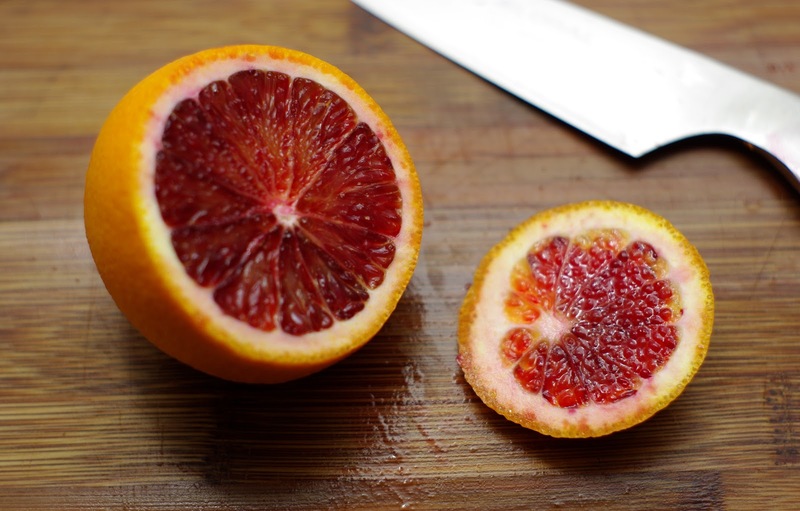 Be sure to use the blood orange variety as regular naval oranges wouldn't be as good or as delightfully fuschia. I paired this glaze with pork but it would also be delicious with veal chops, chicken, or even fish. Serve this dish with sauteed kale, asparagus, or any other green. Combine the orange juice, zest, sugar, vinegar, rosemary, chili and salt in a pot and bring to a boil. Reduce heat to simmer and let cook until the sauce has reduced by half, about 10-15 minutes. The sauce is done when it coats the back of a spoon (generally when the bubbles look like they do at right). Sprinkle both sides of the pork chops with salt and pepper. Heat a drizzle of grape seed oil in a cast iron or oven proof pan. When the pan is hot, add the pork chops. Sear for 3 minutes and then flip and sear for 1 minute on the other side. Transfer the pan to the oven and roast for 5-8 minutes or until the pork chops reach an internal temperature of 155F. Spoon the blood orange sauce over each pork chop. Garnish with orange slices and serve. Addition of citrus gives a whole new dimension to the flavour of food. Delicious looking post.